Hilda Weiss is a fourth generation Californian and an avid hiker and native plant enthusiast. She is the co-founder of Poetry.LA and, in 2012, renovated her own garden using all-natives. In 2014, she convinced the Santa Monica Conservancy to consider a similar ocean friendly plant palette to surround its new headquarters in the Ocean Park neighborhood of Santa Monica. Here is their story. 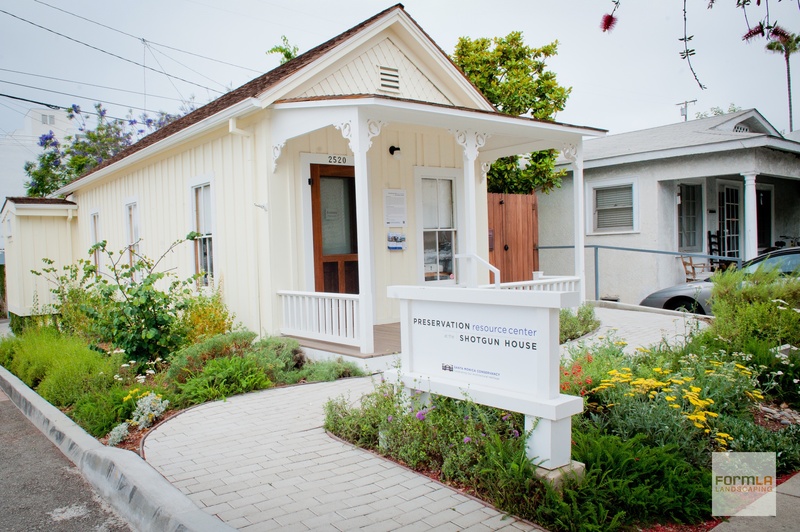 A petite, all-native garden complements this historic 1890s shotgun house, now the Santa Monica Conservancy’s Preservation Resource Center. Planted on the site of a former parking lot, the landscape faces the challenges of a commercial environment, as well as common community concerns. The garden contains coastal natives, including San Miguel Island Buckwheat, Island Snapdragon, California Fuchsia, Common Yarrow, and Coyote Mint which are paired with a miniature bioswale to clean runoff on its last mile to the ocean. The garden was designed by Cassy Aoyagi, president of FormLA Landscaping, funded by community organizations and residents, and is now maintained by the city as well as Santa Monica Conservancy master gardeners Hilda Weiss and Lorraine Sanchez. Preservation The Conservancy preserves Santa Monica’s architectural treasures. Conservation Santa Monica aims to achieve water independence by 2020. Local businesses stepped-up with in-kind donations. City grounds crews as well as Conservancy docents maintain the site. In-Kind: Bourget Brothers donated pavers for the walk way. Fonda-Bonardi & Hohman Architects designed the ADA-compliant approach. FormLA Landscaping donated garden design. Merrihew’s Sunset Gardens supplied the plants, many of them from Theodore Payne Foundation. Smith Pipe and Supply provided pipe for the irrigation system. Zinner Consultants shepherded the project through its LEED certification. A steep ramp became a winding walkway that met ADA compliance and now provides visitors with more vantage points for viewing the garden. The site, a former fire station, posed some challenges. When one of three Western Redbud trees planted in the south garden failed to thrive, a piece of the former station’s foundation was discovered. The tree was replaced with Island snapdragon which has grown well in spite of the limited root space. Natives, planted with appropriate spacing, seemed sparse, and some requested more plantings. The garden team held firm and in a matter of months the garden had filled in. Similarly, when the petite bioswale went in, some did not like the look of rocks in the garden. This issue was resolved by covering the rocks with mulch. Now the garden faces the opposite challenges! It grows quickly, and city gardeners want to buzz cut much of the foliage into hedges. The solution has been for Conservancy docents and master gardeners to brief them on preferences and to contribute to the pruning and shaping process. Articles in the Conservancy newsletter about the garden and the garden docents helped build support for the native plants garden. A Garden Guide handout was created to encourage visitors to explore the garden in more detail. It includes a numbered location map connected to the plant photos and names. A Kid’s Guide to the Shotgun House includes photos and questions about the garden. Youth field trips to the Shotgun House include a segment exploring the native plants garden. A prominent plaque inside the front door of the Shotgun House recognizes donors. LEED® certification is highlighted with photos and text on a wall display.